Back in April I posted on the elusive genetics of bipolar disorder, a crippling psychiatric condition affecting over 2% of the population in any given year. The major message from that article is that although bipolar disorder is massively influenced by genetic factors (around 85% of the variation in risk is thought to be due to genetics) we still don’t really have the faintest idea exactly which genes are involved. This is despite three reasonably large genome-wide association studies involving over 4,000 bipolar patients in total, which generated weak and contradictory results and failed to provide a single compelling candidate for genetic variation underlying this disease. Genetic Future: The challenges of psychiatric genetics. Similar problems will be faced when we turn genetics on the problem of crime, so the post really is valuable for understanding what the controveries in anticrime gene thereapy will be in 10 to 20 years time. Obama and McCain con-sponsor a resolution calling for Georgia to join NATO. Serious talk of expelling Russia from the G-8. Let’s hope so. An organization of economically productive powers, China and India belong in an expanded G-8.. not parasitical states like Russia. Unfortunately, Bush and Obama are signaling weakness. Fortunately, some countries (may) be doing more than just talk. Courtesy of zenpundit… are the Israelis killing Russians? As I predicted, the latest terrorist attack in China is the work of fighters working for an independent East Turkestan. BEIJING, China (CNN) — An attack on a security checkpoint in northwestern China’s Xinjiang Uygur Autonomous Region killed three members of the security force and wounded a fourth, state media reported Tuesday. 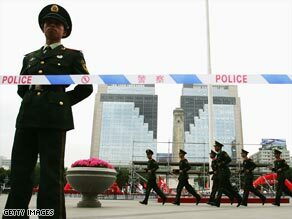 China has tightened security in the Xinjiang Uygur Autonomous Region after recent attacks. At least one attacker jumped off a vehicle passing the checkpoint in the town of Yamanya and stabbed the four men, a local security official told the Xinhua news agency. Yamanya is located about 20 miles (30km) from Kashgar, also known as Kashi, where a raid on border police last week left 16 policemen dead and 16 others injured. China is in a special position to help the United States in our war for Pakistan, because both China and the U.S. have long-standing ties with Pakistan dating from the Cold War.Â We both have been moving closer to India in recent yeras, because of India’s globalization and economic growth. Together we should work to help the government of Pakistan free itself from ISI rule.